Every couple who stays married for any length of time will face some conflict. When two people who were raised in different households with different rules, habits, different parents, there will be some conflict. I have always heard about getting married and living happily ever after, but no one talks about the conflict. Webster’s dictionary defines conflict as; “mental struggle resulting from incompatible or opposing needs, drives, wishes or external or internal demands.” Conflict is inevitable and we must learn how to deal with it! Most of us do not deal well with conflict because we have not been taught how to effectively deal with it. Our normal responses to conflict are to withdraw or attack. What is your normal response? The goal should be to deal with conflict, resolve it, keep loving one another and by all means, stay married! Since the devil hates godly marriages, his job is to do everything that he can to kill, steal and destroy your marriage (John 10:10). However, when we know God we have the power to resolve conflict and live in harmony. Conflict does not have to mean divorce. When handled effectively, conflict can draw two people closer together because it helps you to understand your spouse. 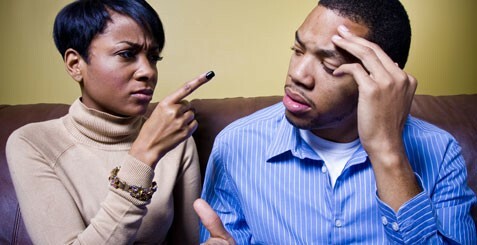 If it is not dealt with, conflict can build a wall between a husband and wife. The wall represents bitterness, fear, resentment, lack of communication and all of those things that keep us apart. Determine that divorce is not an option. Don’t ever make threats to leave or divorce. Stay and allow God to help you work it out. Don’t let the sun go down while you are still angry. (Eph. 4:26-27) Deal with your anger in a timely manner. Be transparent and allow your spouse to be transparent. This means be real and honest about how you feel. Pursue peace. Don’t let days go by with the silent treatment. Be quick to pursue peace. Take time to really listen to your spouse. Listening helps to kill conflict. Don’t get physical. In other words don’t ever put your hands on your spouse or an object in anger. If you must, walk away to cool off, walk in a different room for a limited time. Return to your spouse and deal with the conflict. Lovingly confront your spouse. Always check your attitude. Pray before you speak. Pick the right time and place to handle your conflict. Don’t confront or argue in public or around your kids. Be private. Be willing to forgive. A husband and wife must end conflict in forgiveness in order to have peace. Pray for God’s Spirit to help you to forgive. Don’t keep fussing about the same thing over and over again. State how you feel and then let it go. Ask God to fix it! Don’t try to punish your spouse for something that was done. Pray and let God handle the punishment. Remember all marriages have conflict and that your spouse is not your enemy. Learn to deal with your conflict. Allow God and His Holy Spirit to help you. God is bigger than our conflicts! Excellent Carolyn, thanks for sharing your expertise. I probably most need to work on #2. Andel and I both withdraw during conflict even if that means “sleeping on it” for a day or two. Maybe tackling it right away might be best…thanks again!